7th September 2017, New Delhi: The railway ministry recently underwent in change in senior leadership and now has a new railway minister and chairman of the board. 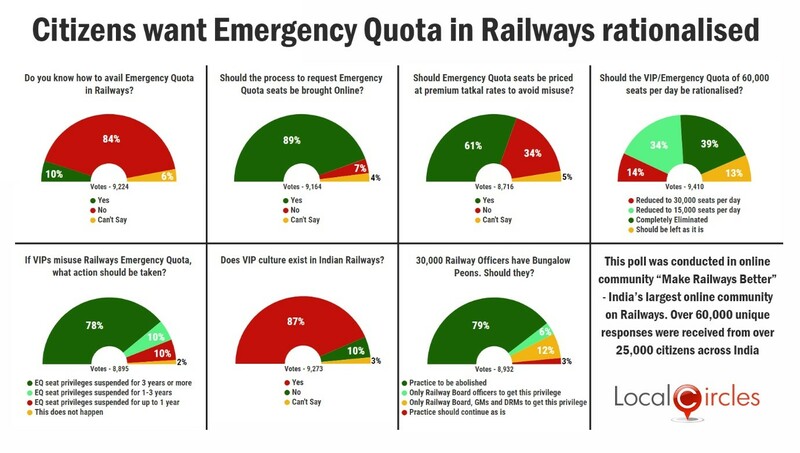 Many citizens in discussions over the last 12 months in Make Railways Better circle on LocalCircles have pointed towards the inability of a common man to access the emergency quota seats whereas the VIPs and their relatives are easily able to access them. The previous railway minister had given some indication of reducing VIP culture in railways and rationalizing the usage of the 60,000/day emergency quota seats. Some steps were also taken to ensure there was a single signatory in all the Member of Parliament offices for authorizing the request. 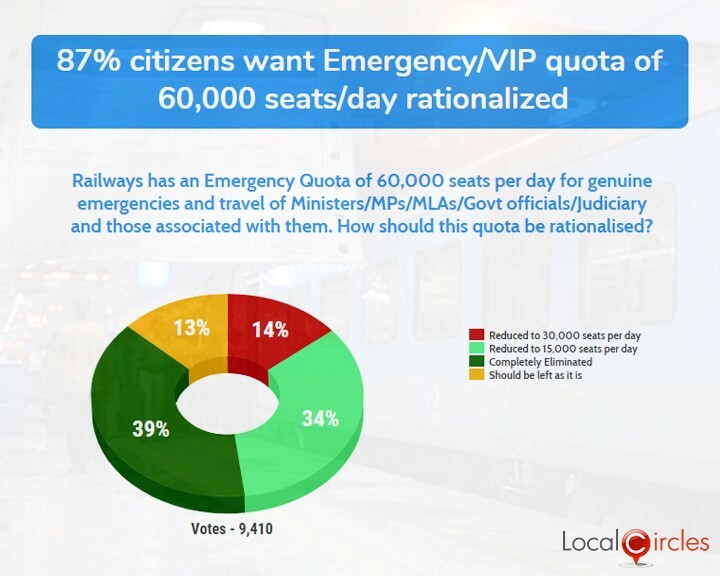 LocalCircles conducted a set of polls to understand the citizen perception of the VIP culture in railways and to help the railway ministry in improving its functioning and profitability. The polls received a total of more than 60,000 votes from over 25,000 citizens located across 250 districts of India. These 7 polls have brought out citizen pulse on the current Emergency Quota, its usage, how it should be rationalized and made accessible to citizens. Also, citizens shared their perception of VIP culture in Railways. Many of them shared their concern about the fact that a large number of Railway Officers continue to have Bungalow Peons at their homes and should this practice continue given the financial situation of the carrier. The first question asked how should the emergency/VIP quota of 60,000 seats per day be rationalized. In response, 14% said it should be reduced to 30,000 seats a day, 34% said it should be reduced to 15,000 seats a day, 39% said it should be completely removed where as 13% said it should be left as it is. A total of 9,410 people voted on this poll. The second question asked citizens if they believe there is VIP culture in Railways when it comes to access to tickets and quotas. 87% replied in an affirmative while 10% replied in a negative. 3% were unsure about it. 9,273 people voted on it. VIP culture has been quite prevalent in railways. Many cases over the years have been reported where the needy and people with real emergencies have been unable to find seats whereas people with connection have easily got seats through VIPs and their quota. The third question asked people if they had the clarity on rules and procedures to avail emergency quota seats in railways. An overwhelming 84% respondents said they had no clarity about it with only 10% saying they knew how it worked. 6% out of the 9,224 votes that came in were unsure about it. 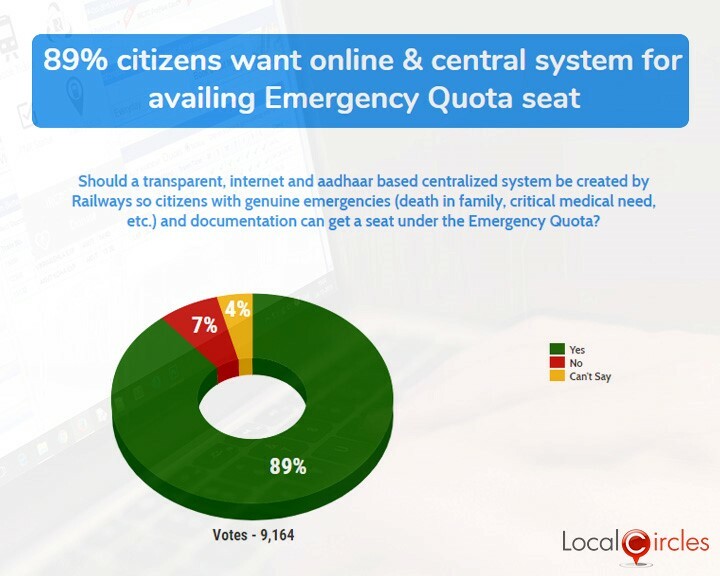 In the next poll, 89% of the 9,164 respondents said that there should be a transparent, internet and Aadhaar based centralized system created by railways so citizens with genuine emergencies and documentation can get a seat under emergency quota. Only 7% said that this should not be the case and 4% chose not to share their opinion. With the functioning of the IRCTC website becoming smooth and ticket booking becoming very easy, people feel that IRCTC should also give an option on their website where people can book emergency quota tickets on presentation of required documentation. 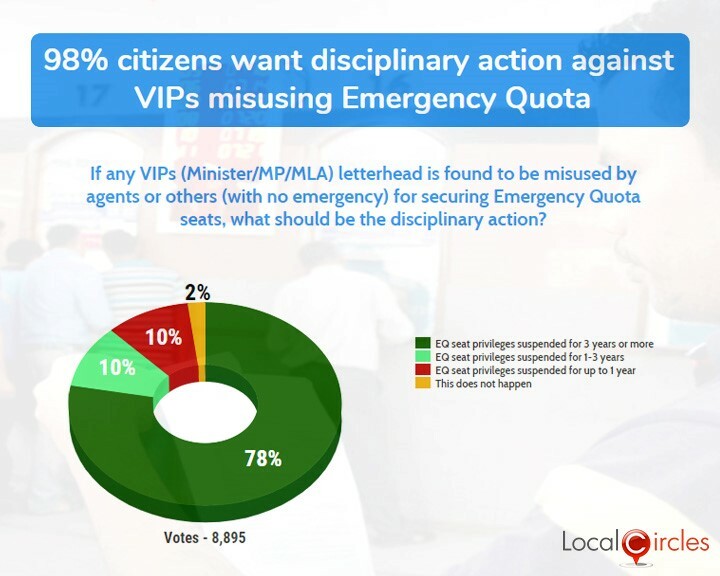 In the fifth poll, 78% citizens said that if any VIPs letterhead is found to be misused by agents or others for securing emergency quota seats, then their privilege should be suspended for atleast 3 years. 10% said their seat privilege should be suspended for 1-3 years, another 10% said it should be suspended for upto1 year and 2% said that this does not happen at all. The sixth poll saw 79% people saying that looking at the financial condition of the railways, the 30,000+ bungalow peons working at the residences of railway officers should be rationalized and the practice should be completely abolished. 6% said that only railway board officers should get this privilege, 12% said only railway board, GMs and DRMs should get this privilege and 3% said the practice should continue as it is. Having bungalow peons is a British era practice which has continued long after independence and the citizens want it now to be minimized so that the railway workforce could be used somewhere else in more productive work. The last poll asked citizens if the emergency quota seats should be sold at premium tatkal rates. 61% respondents replied in an affirmative, while 34% replied in a negative. 5% were not sure about it. The government has taken steps recently to reduce VIP culture on the roads. It is high time that something is done to reduce the VIP culture in railways too and its functioning is made transparent. Citizens have a lot of hopes from the new railway minister and they believe that the existing loopholes in the railway system would soon be plugged. As demanded by the citizens, the emergency quota seats should be made more accessible while reducing the number of quota seats significantly to put railways on the road to profitability.